Our program entitled Regaining Lost Lung Power and Heart Strength is geared for adults aged 45 plus who are feeling the adverse effects of lost lung power and heart strength on their fitness, energy, and stamina. First, we take a look at the lung and heart loss numbers. Next, there is a description, objectives, prerequisites, and structure. At the bottom of the page, you can link directly to the registration page to sign-up for the program. After the age of 25, adults lose on average between 0.5 and 1.0% of their lung capacity per year, if they do nothing to prevent the loss. So, by age 50 you may have lost between 12.5 and 25% of your cardio-respiratory functioning. This means less oxygen is delivered to the cells of your body, which results in reduced energy and greater susceptibility to disease. In addition, it is known that after the age of 25, adults lose on average between 0.5 and 1.0% of their muscle mass per year. So, by age 50 you may have lost between 12.5 and 25% of your lean, muscle mass, which results in weight gain, because muscle mass burns calories, but fat mass does not. The above also applies to your heart, since it is muscle in its own right and needs regular work as well. Is it time for you to begin to recover the losses? 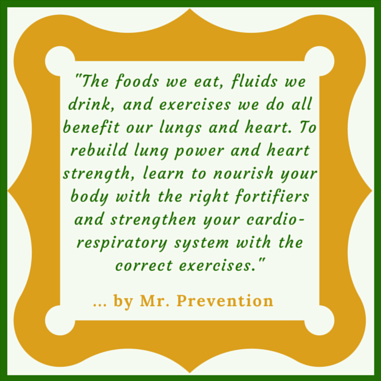 It maybe time for you to begin to recover your lost lung power and aerobic capacity, as well as your lost heart strength and pumping capacity with this 16-week combined lung and heart, nutrition and exercise program. And, during the program, you will begin to feel the energy in your steps again! Gains in cardio-respiratory efficiency, lung power, and heart strength are the hallmarks of this two-pillar, 16-week adult fitness program! The Regaining Lost Lung Power and Heart Strength program is designed to rebuild the necessary aerobic and pumping capacity, as well as add conditioning gains, so you can maintain your activities of daily life and/or prepare yourself for more vigorous exercise programs. active adults who need to improve their cardio-respiratory fitness. increasing functional fitness throughout the body. Appointment #2: Here, we first delve into our past and discuss the origins of heart disease. After that we get into the natural whole foods way and the top fluids to regain and then maintain your heart and lung health over time. Improving HDL Cholesterol: How, Why, and Now! Appointment #3: In this appointment, fortifiers that nourish and repair your heart and lungs are introduced, as well as antioxidants that prevent free radical inflammatory damage to these same vital organs. Appointment #4: First, Cardio-respiratory Fitness Program is discussed, and then assessment testing is conducted to evaluate your current level of cardio-respiratory fitness to establish a baseline for the sessions that follow. Session #5 to #8: Here, we begin the implementation of the IFT Model: Component 2: Cardio-respiratory Training to improve your cardio-respiratory fitness. The focus in Phase 1 is on establishing an aerobic base to prepare you for the aerobic efficiency training in Phase 2. Session #9 to #14: Here, we progress with the implementation of the IFT Model: Component 2: Cardio-respiratory Training with aerobic efficiency training. The focus in Phase 2 is to enhance your aerobic efficiency by way of an interval training program. Session #15 to #26: Now, we progress further and increase the intensity with a combined cardio and strength circuit. These total body workouts are based on structured circuits that are sequenced with intervals and employ a combination of aerobic-based and strength-based body-weight-only exercises. To feel the energy in your steps, head to the registration page. To sign-up for the program, head over to the registration page now and fill out the form with your contact information.